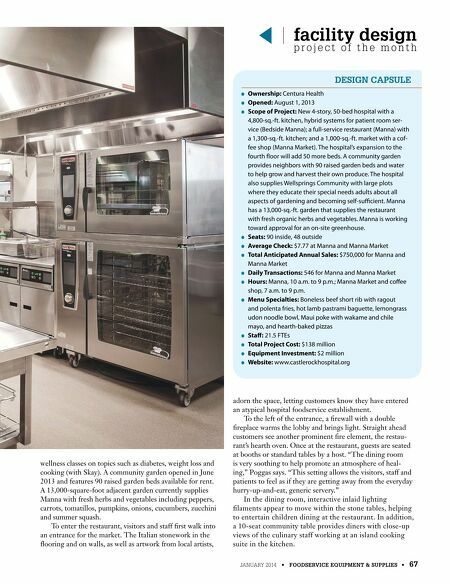 66 • FOODSERVICE EQUIPMENT & SUPPLIES • JANUARY 2014 Adventist's program CREATION Health. "Hospital admin- istrators are working to shift the hospital paradigm from a facility people think of exclusively to treat illness to a place to go to support their wellness," says Lisa Poggas, MS, RD, di- rector of nutrition and environmental services for the 50-bed Castle Rock Adventist Hospital and its sister facility, 141-bed Parker Adventist Hospital located 15 miles away. "As far as we know, we're the only hospital in Colorado offering a full- service restaurant. We're quite proud of that." Financial acumen was also factored into the foodservice operations. Positioning the restaurant and market near the entrance encourages customers to walk in and buy impul- sively as well as arrive with the destination in mind. In addition to featuring a restaurant and market, the foodservice operation, designed through close collaboration between Daniel Skay, nutrition manager and executive chef, and William "Billy" Inman, president of Inman Foodservices Group LLC in Nashville, supports patient room service. All of these dining options feature fresh foods made from locally sourced ingredients. Castle Rock also offers A quick-speed oven sits at one end of the European cooking suite used for both the restau- rant and room service. 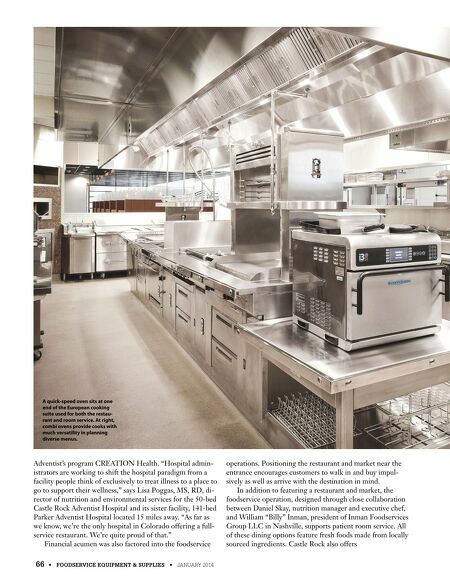 At right, combi ovens provide cooks with much versatility in planning diverse menus.